Waterbirds continued to flock to Hospital Swamps during 2014–15, with lower water levels in the wetlands providing feeding and breeding opportunities. 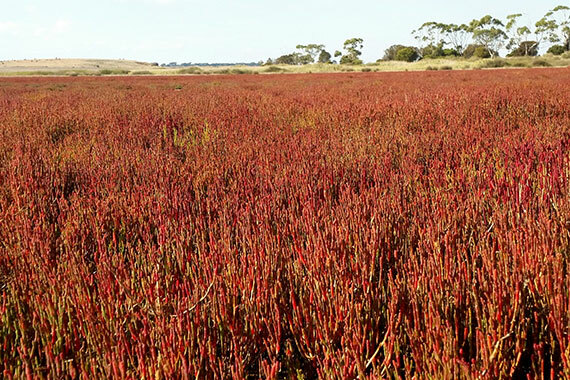 The aim of the environmental watering program at the lower Barwon wetlands is to maintain their ecological character, including their saltmarshes, abundant waterbirds and native plant species. In December 2014, the inlet regulator to Hospital Swamps was shut to facilitate a natural drying regime (link to seasonal senarios page) over summer. While there were no further inflows until the regulator was opened again in April 2015, there was only a small reduction in the water level in Hospital Swamps due to mild temperatures and rainfall over summer. Despite this, the lower level in the wetlands contributed to soil salinisation, an important process in estuarine wetlands, benefiting coastal saltmarsh plants and providing feeding and breeding habitat for waterbirds and the threatened orange-bellied parrot. Surveys by the Geelong Field Naturalists Club, on behalf of BirdLife Australia, found a myriad of wetland bird species at Hospital Swamps during 2014–15. Over 25 species were recorded at the wetland, including pink eared ducks, Australian white ibis, royal spoonbills, cormorants, grebes, swamp hens and egrets.